What are they entitled to? Included in the payment of the "Regular Fees" is a free print subscription to NDT. Every month NDT, one of the world’s leading journals devoted to original clinical and laboratory research in nephrology, dialysis and transplantation, provides readers with the latest clinical research in the field to improve patient care and outcomes. NDT’s Impact Factor of 4.085 (2015 Journal Citation Reports®, Thomson Reuters, 2015) makes NDT the leading European nephrology journal and a very valuable benefit of ERA-EDTA membership. The "NDT" monthly print issues are NOT sent to those members who pay the "Online", “Junior” and “Reduced” membership fees. IMPORTANT! The ERA-EDTA Council has decided to extend the “Special Discounted Membership Fees” to members living in all Countries in the world whose Gross Domestic Product per capita income is less than USD 10,000 a year (calculated on the 2017 data of the International Monetary Fund, World Economic Outlook Database). This discount will be valid for the 2019-2020 and 2021 annual ERA-EDTA membership fees. If you live and work in one of the Countries listed below you are entitled to pay these special discounted fees– for more details click here). LIST OF COUNTRIES WHOSE MEMBERS PAY THE SPECIAL DISCOUNTED ANNUAL ERA-EDTA MEMBERSHIP FEES FOR THE YEARS 2017-2018-2019. Afghanistan, Albania, Algeria, Angola, Armenia, Azerbaijan, Bangladesh, Belarus, Belize, Benin, Bhutan, Bolivia, Bosnia and Herzegovina, Botswana, Bulgaria, Burkina-Faso, Burundi, Cambodia, Cameroon, Cape Verde, Central African Republic, Chad, Colombia, Comoros, Cote d’Ivoire, Democratic Republic of Congo, Democratic Republic of Timor-Leste, Djibouti, Dominica, Dominican Republic, Ecuador, Egypt, El Salvador, Eritrea, Ethiopia, Fiji, Gabon°°, Gambia, Georgia, Ghana, Grenada°, Guatemala, Guinea, Guinea-Bissau, Guyana, Haiti, Honduras, India, Indonesia, Iran, Iraq, Jamaica, Jordan, Kazakhstan°°, Kenya, Kiribati, Kosovo*, Kyrgyz Republic, Lao People’s Democratic Republic, Lesotho, Liberia, Libya°, Madagascar, Malawi, Maldives°, Mali, Marshall Islands, Mauritania, Mauritius°, Mexico°°, Micronesia, Moldova, Mongolia, Montenegro, Morocco, Mozambique, Myanmar, Namibia, Nauru°°, Nepal, Nicaragua, Niger, Nigeria, North Macedonia, P.R. of China, Pakistan, Palestine, Papua New Guinea, Paraguay, Peru, Philippines, Republic of Congo, Rwanda, Samoa, Sao Tome and Principe, Senegal, Serbia, Sierra Leone, Solomon Islands, South Africa, South Sudan, Sri Lanka, St. Lucia, St. Vincent and the Grenadines, Sudan, Suriname, Swaziland, Syria, Tajikistan, Tanzania, Thailand, Togo, Tonga, Tunisia, Turkmenistan, Tuvalu, Uganda, Ukraine, Uzbekistan, Vanuatu, Venezuela, Vietnam, Yemen, Zambia, Zimbabwe. *- This designation is without prejudice to positions on status, and is in line with UNSCR 1244/99 and the ICJ Opinion on the Kosovo declaration of independence. All active ERA-EDTA members, except members who pay the “Reduced” fee, are entitled to receive free access to NDT. CKJ is now a fully open access, online only journal publishing bimonthly. All CKJ content can now be viewed online for free at https://ckj.oxfordjournals.org. The online versions of the journals have outstanding features: Electronic Table of Contents (eTOC) alerts; Advanced Access publication; PowerPoint download of figures; CiteTrack; RSS Feeds; mobiled optimised sites; and PDA Access. Visit the journals online at https://ndt.oxfordjournals.org and https://ckj.oxfordjournals.org to learn more about these features and to sign-up or activate your online access. A key ERA-EDTA membership BENEFIT is that members are able to access the complete electronic archive of NDT – see more details below. To register for online access you must follow the simple instructions explained below. You will need your NDT subscription number (8 digits) to create your own password - you will find this on the address label of your printed copies of NDT, or you can request it by contacting the ERA-EDTA Membership Office (membership@era-edta.org). First you must set up an account with Oxford Journal "My Account" which will allow you to manage your subscriptions and access other useful services. 1. Your contact details, including a name contact, postal address and email address so we can keep you up-to-date with changes and improvements to our service. 2. A username and password. Keep a secure record of these details as you will need them to access your account in future. 3. Confirm your new account by clicking "submit". 4. You will now need to activate your subscriptions in order to access the full text online. 1. Select "Manage Your Subscriptions" from the "My Accounts" page. 2. Before registering for access to your subscriptions both personal and institutional subscribers must first read and agree to the term of the online license provided on the screen. 3. Next enter your subscriber number in the box provided (8-digits-NDT number). 4. Once the subscriber number has been registered, personal subscribers may access the full text of their subscriptions using their username and password. Go to www.oxfordjournals.org to search or browse your selected titles. Publisher of the official ERA-EDTA Journal "NDT" and "CKJ"
One important benefit of ERA-EDTA membership (except for those members who pay the “Reduced fee”) is that you are able to access the complete electronic archive of NDT, from Volume 1 issue 1 dating back to 1986 when it started publishing. Whilst most NDT subscribers can access content back to 1996, content earlier than this is considered a valuable archive and requires a special subscription to access it – which all ERA-EDTA members have! ERA-EDTA members have access to this valuable resource, which means that about a further 10,000 pages of high-quality research will be available to you. Nephrol Dial Transplant Jan 01, 1993; 8: 1089-1093. Nephrol Dial Transplant Nov 01, 1995; 10: 1963-1974. Nephrol Dial Transplant Jan 01, 1992; 7: 467-471. Nephrol Dial Transplant Sep 01, 1995; 10: 1620-1628. Nephrol Dial Transplant Jan 01, 1993; 8: 1094-1098. All ERA-EDTA members can access the presentations of most of the CME Courses organized during the year by ERA-EDTA (some also in collaboration with ISN and other Associations). This is an exclusive ERA-EDTA membership benefit and you can use the personal Username and Password to access the ERA-EDTA Members' Restricted Area that is printed in your membership payment receipt, or you can request it by contacting the ERA-EDTA Membership Office. 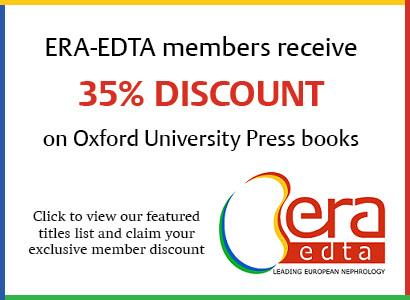 All members of ERA-EDTA who have regularly paid their current annual membership fee (as well as all Honorary Members and all Senior Members) are entitled to receive a 35% discount on all Oxford University Press medical publications. 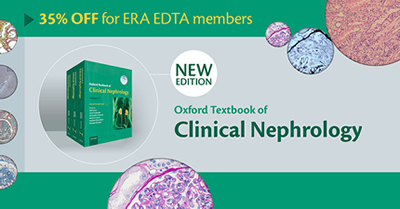 OUP's comprehensive range of nephrology books is suitable for nephrologists at every level. Go to this OUP dedicated ERA-EDTA web-site to see a list of all the titles and to order them directly on-line. If you are interested in a title not included in this list, please contact Direct Sales Department at OUP directly (fax number: ++44 (0) 1536 454518, e-mail address bookorders.uk@oup.com). Major investments are made by the Association to improve the scientific and educational contents of our annual Congress. For more information on the next ERA-EDTA Congress , click here. All Congresses will provide up-to-date information on basic science, clinical nephrology, dialysis and renal transplantation. These topics will be presented in plenary lectures, mini lectures, symposia and free communications by world known experts. Special discounted Registration fees are applicable for all those members who have paid their current annual membership fee. See the Congress Website for more updated information. Please note that congress members submitting and paying their registration fee as non-members will not be entitled to reimbursement if, at a later stage, they become members. Including the “ERA-EDTA Directory”, the “European Community Financial Opportunities”, the new “Presentations of the CME Courses” and the “Important Congress and Abstract dead-lines”. Only ERA-EDTA members are allowed to access the ERA-EDTA Members' Restricted Area. Here members will also find the “Presentations of the ERA-EDTA CME Courses” and the “ERA-EDTA Directory” that contains the addresses phone, fax and e-mails (when available) of all ERA-EDTA Members as well as up-dated calls for financial opportunities in the fields of interest of the Association given by the European Community and many other important and extremely useful information. The Username and Password to access this area is printed on the ERA-EDTA membership payment receipt, or you can request it by contacting the ERA-EDTA Membership Office. As part of the collaboration between ERA-EDTA and EuroPD we are delighted to confirm that EuroPD CME videos in Peritoneal Dialysis are available online and free to ERA-EDTA members. Please click here for more information. Free online access to "Seminars in Dialysis" to all ERA-EDTA members! Click here for more information. More benefits for ERA-EDTA members! Check out the new European Nephrology Portal. ERA-EDTA Dialogues was launched to enable online discussions about Nephrology. In it, Senior Editors, with the help of Junior Editors and Invited Experts, offer their knowledge and expertise to Nephrologists, especially the younger ones, to start and comment on discussions, allowing them to learn through an interactive dialogue. To access all the ERA-EDTA Dialogue discussions click the specific banner on the ENP Website: www.enp-era-edta.org and log in with your username and password. The ERA-EDTA Dialogue is an exclusive tool for ERA-EDTA Members registered to ENP. During the log in, the system will automatically check if you are also an ERA-EDTA Member to allow you a rapid access.